The lengthy equipment list of job-shop fabricator Cupples J&J Co. recently became even longer, with the addition of a twin-head waterjet-cutting machine. It furthers the growth philosophy of vice president Jeff Cupples, who says, "There are no challenges, just opportunities." Unique among U.S. tool designers and builders, Pyper Tool has added a servo press to refine the tryout process, and hopes to incorporate what it learns to build servo-specific dies. FABTECH 2014, held in Atlanta last November, set records for attendance and exhibitor space, and served as a showcase for hundreds of new-product introductions. Heres our edition of a top-10, trying to sample a little bit of everything; we'll have plenty more in coming issues. Heres a testament to simultaneous stamping-die design and development, where CAD/CAM software integrates the diemaking process from quote to delivery. The result: improved quote hit rates, slashed lead times, reduced costs and optimized quality. 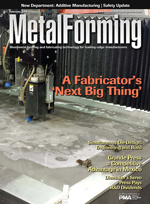 ...contributes to the competitive advantage sought after by this IL-based metalformer looking to make its mark in Mexico, providing stampings, fabricated assemblies and more to the truck and construction markets.